Reno is one of the largest cities in Nevada, with a population of over 220,000. The city is located 38 miles northeast of Lake Tahoe, on the eastern edge of the Sierra Nevadas. At an elevation of about 4,500 feet, Reno's high desert location boasts over 300 days of sunshine each year, making it ideal for outdoor pursuits. Reno-Tahoe International Airport is a major hub for visitors to the region. Alpine and cross-country skiing as well as biking, hiking, kayaking, hunting, and a host of other outdoor activities draw adventure seekers year-round. Visitors looking for relaxation and luxury head for the casinos and championship golf courses, one of which hosts the annual Legends Reno-Tahoe Open PGA Golf Tournament. 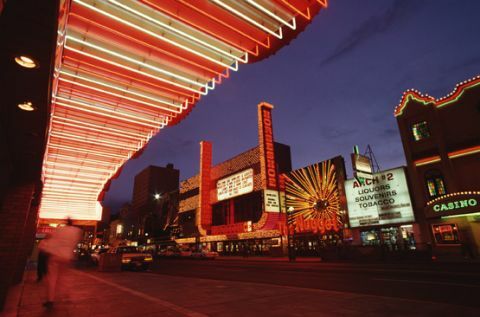 Like Las Vegas, Reno is famous for its world-class casinos; Harrah's was founded here. Local landmarks include Virginia City, home of the famous Comstock Lode, and such diverse museums as the National Automobile Museum, the Nevada Museum of Art, and the National Bowling Museum. • City of Reno - Visit the Reno, Nevada official government web site. • Reno Guide - Business directory and maps of Reno, Nevada.